Since the beginning of trade a millennia ago, information to make investment decision to buy or sell has governed the markets starting from rudimentary commodity to spices and goods to a plethora of exotic derivatives across asset classes found in the modern markets. Investors have always been rewarded for their astute decision making, fortunate timing and thorough due diligence. This article (and Access Square as a startup) is focused on the last one: investor due diligence, specifically that done in person — face to face. 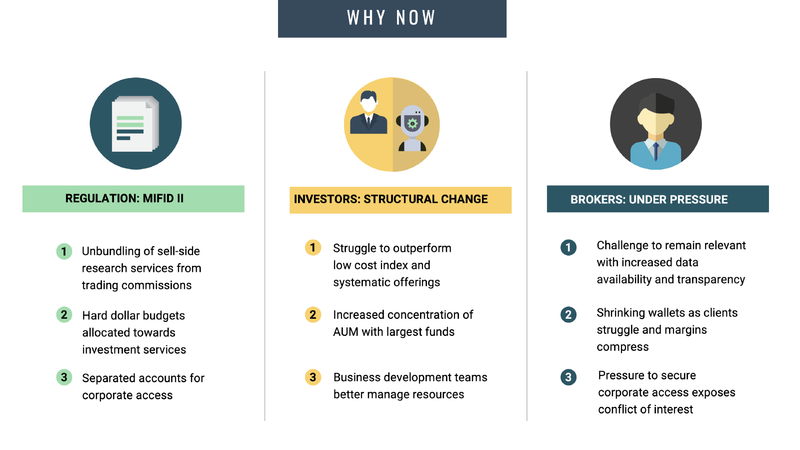 As in any two-sided market place, brokers exist to facilitate the practiceof setting up meetings between institutional investors and management of public companies these investors invest into. This practice is called corporate access, and despite its mostly administrative nature — coordinating schedules — the service makes up 30–50% share of $8.4 billion spent on U.S. brokerage commissions in 2017. 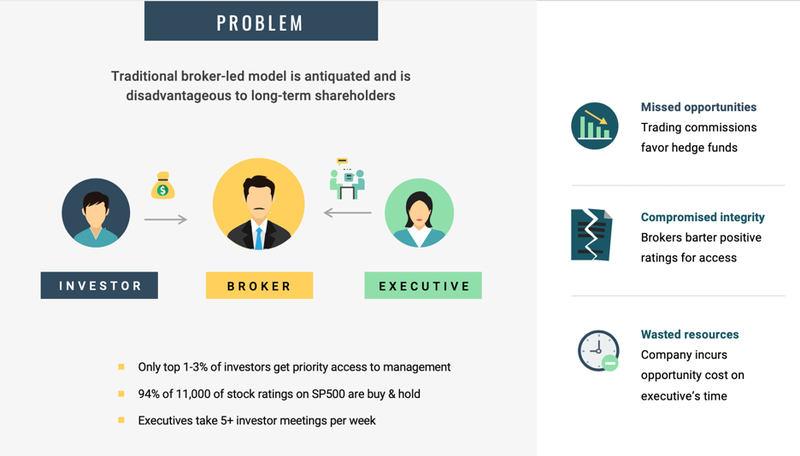 Now, brokers who sit in offices such as those of JPMorgan and Goldman Sachs offer more than just meetings to investors: services include market intelligence, investor feedback, industry views and earnings estimates along with price recommendations. 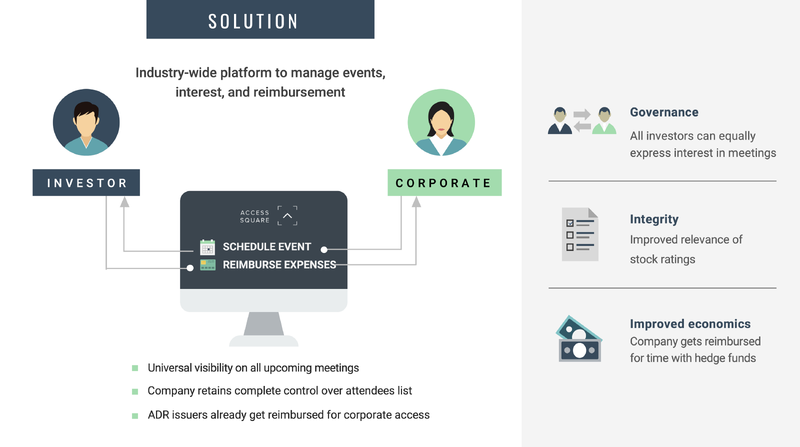 Given the disproportionate wallet share dedicated to corporate access and the administrative tasks of setting up meetings, a new set of startups have sprung up to do the job more cheaply and with better technology. With only 5% of corporates reporting use of third-party (i.e. startups, consultants) in 2018, the market is open for startups to take on greater share. Smaller investors miss out as brokers paid on trading commissions favor high turnover hedge funds. 1–3% of investors consistently get priority access to these corporate meetings through brokers. Incentive structure that creates biased investment research within public equity markets, as broker implicitly barter positive stock rating for access to senior executive time. The bias can be seen in that ~94% of 11,000 of stock ratings on SP500 companies are either buy or hold, hardly objective in aggregate. Distraction for corporate executives away from running the business. Executives at a median large public company in the U.S. on average take 5+ investor meetings per week that could be allocated towards building the business. Moreover, the price of the executives’ time is roughly $11,000 — $12,000 per meeting. The cost of travel of $5,000 per meeting quick adds up to 24% of the average executive’s dedicated travel budget of $658,000 in North America in 2017. Stronger governance so anyone can see any upcoming meetings and express interest directly. More incentives for unbiased investment research by eliminating the implicit quid pro quo exchange of favorable stock coverage for access to management. Corporates retain complete control over attendees lists. Better economics for corporates by compensating executives for the time they spend with short-term investors (i.e. hedge funds). As it stands, ADR issuers have already established a similar practice of being reimbursed by their service providers for corporate access. Over the last 5 years, a number of start-ups, primarily in Europe, have focused on aggregating information and arranging meetings. Yet none have been successful in a direct model circumventing the brokers completely. We believe the key to success lies in improving the supply side of the equation through greater incentive to the corporates. Moreover, going direct allows for a scalable business model that does not depend on trading commission. At Access Square, we encourage long-term thinking by providing favorable terms for long-only investors to use the platform. MiFid II first established in Europe is becoming widely adopted in the U.S. by multinational investment firms. The regulation not only brings greater transparency and unbundles investment research from trading commissions but also brings more scrutiny to the value of services provided by brokers. Structural margin pressure on fundamental investors given the proliferation of passive low-cost alternatives and successful quantitative strategies. Brokers struggle to to remain relevant in a data-rich environment exposing inherent conflicts of interest and requiring greater reliance on higher margin services such as corporate access. Overall, with the recent (long overdue) innovations in the corporate access arena, it’s easy to lose sight that the practice is still a relationships business. It will take years to form new habits and shift entrenched interests. 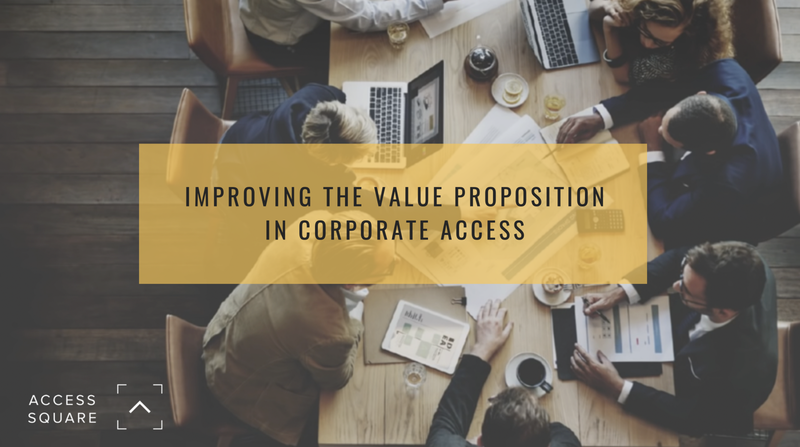 Brokers will continue to set up corporate access meetings but with time, investors and corporates will realize they both get a better deal through direct corporate access platforms.